The Birth of a Man. The Birth of a Legacy. These words grace the grand entrance of the Bronx High School of Science in New York City, the school where Bob began seriously studying what was to become his life long passion: the intersection of music and science. Not only did Bob excel in his studies, but he found intellectual companionship in his fellow student body for the first time. Today, May 23, 2011, we celebrate what would have been Bob’s 77th birthday by sharing with you a precious, rarely seen document. 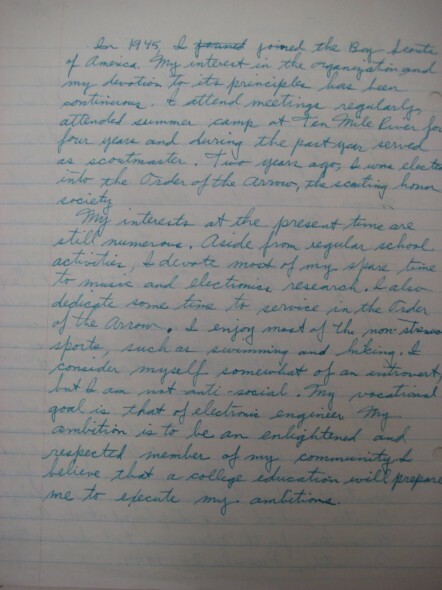 Below is Bob’s personal statement from November 10, 1951. He was 17 years old  a senior at Bronx High School of Science. This document was required of each senior for inclusion in applications to prestigious colleges. There are a few small errors in the document, which leads us to believe that it was a draft that was later typed and submitted. It reveals much about Bob’s focus at 17 years old. A copy of this statement was provided to the Moog family by Bronx High School of Science. Many thanks to this exceptional school for preserving Bob’s records and for nurturing scientific minds for decades. Our world is better for the education they offer. When I was six years old, I was enrolled in P.S. 24 (Flushing). I enjoyed school and had no problem in garnering high marks. Two years thereafter, I began taking piano lesson(s). While in sixth grade I wrote a winning composition on Fire Prevention, and received a medal from the mayor. At this time, I became interested in science. My father, who is an electrical engineer, encouraged me in my interests. I experimented first with chemistry, then with electricity, and finally with electronics. I graduated from P.S. 24, winning the scholarship and commendation medal. I then enrolled in Bronx High School of Science. My interest in music and science was increasing rapidly. After I built a theremin, my interest in these subjects rose to a new high. Since my entrance in to high school, I have been experimenting with electronic musical instruments. 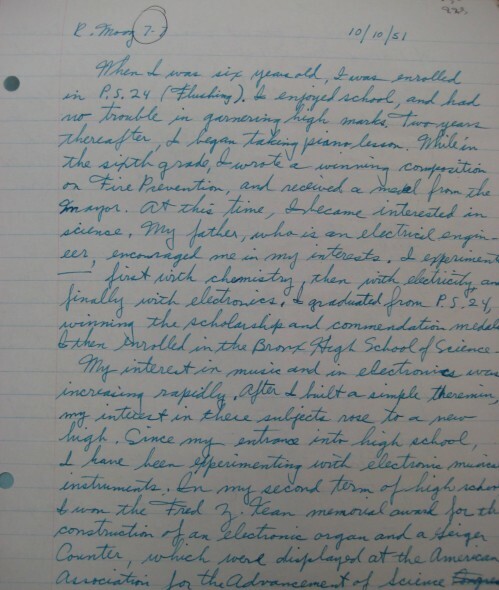 In my second term of high school I won the Fred Z. Kean memorial award for the construction of an electronic organ and a Geiger counter, which were displayed at the American Association for the Advancement of Science Convention, December 28, 1949. In 1945 I jointed the Boy Scouts of America. My interest in the organization and my devotion to its principles has been continuous. I attended meetings continuously, attended summer camp at Ten Mile River for four years and during the past year served as scoutmaster. Two years ago, I was elected in to the Order of the Arrow, the scouting honor society. My interests at the present time are still numerous. Aside from regular school activities, I devote most of my spare time to music and electronics research. I also dedicate some time to serve in Order of the Arrow. I enjoy most of the non-strenuous sports, including swimming and hiking. I consider myself somewhat of an introvert, but I am not anti-social. My vocational goal is that of an electronic engineer. My goal is to be an enlightened and respected member of my community. I believe that a college education will allow me to execute my ambitions. Happy birthday Bob! Here’s to a life well lived and to the young beginnings of an extraordinary legacy. Brilliant. I miss you Bob.. I met Bob in 1969 in San Francisco. I had access to and performed with one of the only portable Moogs in the world. Beaver & Kraus had one in a studio in LA, there was Bruce Hatch’s one which I performed on, and later one that was at the Heliport in Sausalito in the mid ’70s. Bob was such a sweet guy and I was thrilled to meet him and have his encouragement with my performing. I would love to share my library of music with you from that era. Happy birthday to Bob and best wishes to his family and foundation! That is just precious. “My goal is to be enlightened and respected member of my community”. Just so dear. Belated birthday wishes to a brilliant pioneer. And many thanks to his family and the Foundation for sharing this wonderful letter. It appears the young Mr Moog was well set on his course to success, having the desires, dreams and dedication necessary to make it happen.